Busted for bringing in contraband, eight Indian River County Sheriff’s Office employees now have suspensions on their records, according to an internal affairs summary recently released to Contact 5. But the contraband wasn’t for inmates. It was for the employees. According to the report, seven deputies and one records specialist turned their jail block into a makeshift Blockbuster by sneaking movies like “Guardians of the Galaxy”, “Zoolander”, and “Deadpool” in on thumb drives. “As soon as we found out about it, we were concerned, because if folks are watching movies, clearly they are not watching their posts,” said Major Eric Flowers. The report shows staff initiated an investigation after discovering “computers in the jail were having issues with adequate storage space.” That is when investigators found more than 40 feature films, including “The Revenant”, “Robin Hood: Men in Tights”, and “The Dark Knight” stored onto the jailhouse server. Turns out, deputies allegedly smuggled in the blockbusters by storing them on thumb drives. Several admitted to playing movies directly from the drives; other admitted to watching along. However, anytime an employee would play a flick from the thumb drive, a copy of the file was being stored on the server. Officials worried the copied flicks could have “corrupted data within their files,” which might “contain backdoor programs or malware that could negatively affect the IRCSO server,” according to an email which initiated the investigation, sent by the jail’s Assistant Director of Information Services. Flowers told us nothing was compromised, but that did not stop the sheriff from suspending some staff eight to 16 hours for neglect of duty. Other staff members also received an additional 24 to 32 hours for unbecoming conduct. 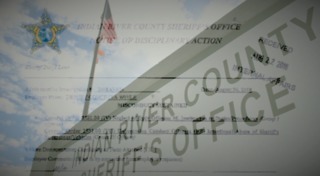 “The suspensions that resulted in this were appropriate based on the employees level previous discipline and certainly these employees are well aware that if they continue this activity or any other activity, they will no longer work for the Indian River County Sheriff’s Office," Flowers said. Flowers could not say if the movies were illegally downloaded. “We would have to be able to prove that the movies were illegally downloaded because it’s not illegal to copy movies that you own,” said Flowers. However, Contact 5 found emails in the internal affairs file which claim the movies were pirated. One deputy also admitted to downloading movies from “websites on the internet,” according to the report. According to Flowers, the jailhouse server is already regularly screened for malware programs and employees are already randomly audited. Additionally, certain websites are restricted from access. As a result of this investigation, all employees are getting a refresher on internet safety and supervisors are expected to monitor employees.